Most people go through life on a daily, endless round of chores and tasks - paying bills, going to school, working a job, raising a family. Many live their lives in ignorance of the danger that passes them on the street or lives in the mansion on the hill, walking through a bright blindness all their lives. Some, however have their blindfolds ripped off, and the truth laid in front of them: monsters walk the world. Mundane concerns are swept away - there is no choice but to act. 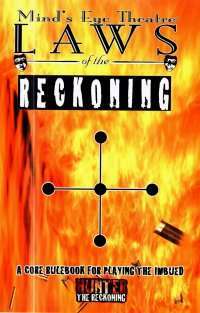 Laws of the reckoning contains all the material that players and Storytellers need for creating, playing and Storytelling those mortals who have become imbued. From creating preludes, to the hunter classes, to Abilities and Attributes, to the power of the Edges, and Storytelling, this book has it all. All that remains is the choice - take up the good fight, or stand on the sidelines. There is no returning to ignorance.